RRSPORT.CO.UK • View topic - Epb dashboard light??? Home > Faults & Fixes > Epb dashboard light??? Epb dashboard light does not show up at all when turn key or when applying or disengaging, I have tested EPD lever and it does work but it's guess work if it's on or off as no Red P light on dash showing. Is it a simple fuse? Is it a MOT fail if no light showing? Range rover sport 3.6TD V8 2007. Please is there a answer to my questions. I tested it today on hill and all is working as it should hearing it coming on and off, but it's only by sound and realising the brake and not moving as I have no light on dashboard confirming it's on or off. I’ve looked at the wiring diagram and the control of the lamp is from the Parking Brake Module underneath the car. 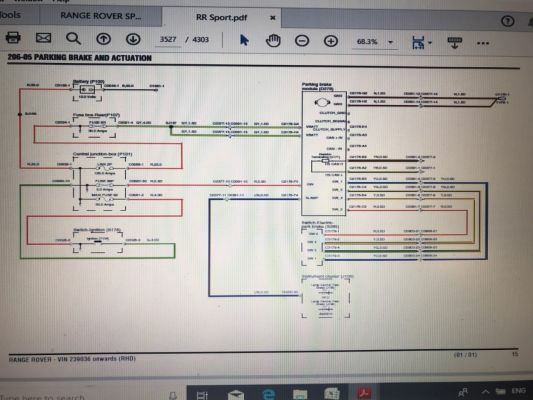 You could do a continuity check between pin F4 on the module connector to pin 20 on the instrument cluster connector as it may be a wiring issue. If you find a fault in the wiring there is another body to chassis connector which you can check for corrosion. If the wiring has continuity then I think it’s the parking brake module or at least the connector (could be worth giving this connector a real good clean). All that went over my head😎, will pass on diagram to someone that understands, hope it's corrosion, I've looked at stripping dashboard and looks like there LEDs soldered and pulling out the clock handles which looks it needs delicate touch which I certainly don't have. Update I put it through MOT and passed, NI Mot is much more stringent then the mainland imo. I waffled to him to distract him while doing the brake test lol, when he put it on the ramp and doing his inspection's he dropped down ramp and leaned in vehicle never seen this before in all tests I've put cars through, he obviously could not tell handbrake on or off so he jumped in and then ramped up and more tests, off ramp he was playing around as I could see him stop start and looking at dashboard, got out thumbs up...phewwww. another year.